Access Mechanical Handling - The Smart Choice For Forklifts in Scotland > NEWS > forklifts > WHEN ARE FORKLIFTS NOT FORKLIFTS? WHEN ARE FORKLIFTS NOT FORKLIFTS? When Is A Forklift Not A Forklift? UTILIZING YOUR FORKLIFT TRUCK TO ITS MAXIMUM CAPABILITY. A forklift truck is a name we all associate with a truck for moving and stacking pallets. In actual fact, “industrial truck” could be a better description as forklifts can be used for other duties that sometimes we forget to consider. Forklifts are used in many handling situations but usually modified specifically to that application. e.g.paper reel handling, appliance handling, carton clamps,etc. However there are many relatively inexpensive attachments which can be fitted to the forks of most forklifts that enables better and more efficient use of your forklift truck. Attachments are easily fitted to the forks that transform the forklift into a small crane, work platform, snowplough, scoop or acquiring self dumping hoppers to assist in general maintenance of the factory environment. Most forklifts now come fitted with side shift as standard but the inclusion of a fork positioner enables more efficient operations with less damage to goods, also leaving the forklift operator more time to safely handle product. One badly positioned fork could cause enough damage to your products that would easily repay the cost of the attachment. It is certainly worthwhile considering an analysis of your forklift usage. The cost today of a decent forklift can range between £7K(used) to £15K(new) so why not get a bit more from this investment? 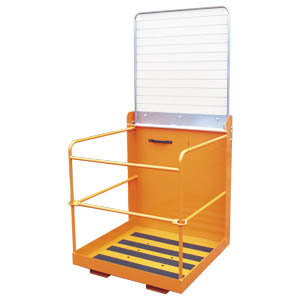 You can view the full range of our most popular forklift attachments on our forklift attachments page or if you would like more information on this subject and your forklift usage why not give experienced staff at Access Mechanical Handling a call? You can reach us now 0n 01698 745859 or simply drop us an email via our contact page and we’ll do the rest. At Access Mechanical Handling we supply sales, hire and leasing on new and used forklift trucks and forklift attachment. We supply a full range of gas powered forklifts, diesel powered forklifts and electric powered forklifts. We mainly supply forklifts to companies in the Glasgow and Edinburgh areas, including Kilmarnock, Ayrshire, Livingston, Dumfries and Galloway, Bellshill, Motherwell and Lanarkshire. However we can also offer our excellent service to companies in Dundee, Inverness, the Highlands, Aberdeen and anywhere in Scotland.